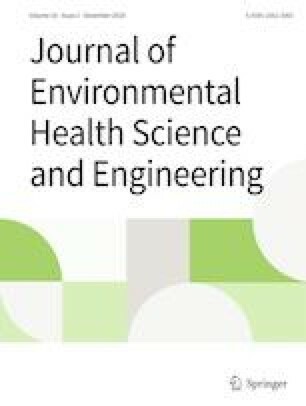 To address the question of whether users of herbal products (HPs) are exposed to harmful contaminants, we evaluated six HPs mostly patronized in Kumasi for heavy metal contamination and assessed the health risk associated with their use. This study is one of the first safety evaluation studies on finished multiherbal products in the region. Three antimalarial, two antidiabetic and one antihypertensive HPs were selected after a mini-survey and coded randomly as HP A-F. The HPs were acid digested for quantitative analysis of heavy metals using Inductively Coupled Plasma Mass Spectrometer. Hg quantification was carried out using cold vapour atomic absorption spectroscopy. The cancer risk estimation values for the carcinogenic metals ranged between 1.54 × 10−9 to 3.73 × 10−4 and were all within acceptable limits. The non-cancer health risk evaluation revealed that, some of the products pose health risk to consumers. The estimated daily intake (EDI) for As in HPF was 2.48 × 10−4 mg/kg/day compared to the reference limit of 1.67 × 10−4 mg/kg/day. HPF also had high hazard index (HI) of 5.70 (HI >1) in children as compared to 1.68 (HI >1) in adults showing a 3.4 folds increase in the health risk among the former. The six polyherbal products exhibited carcinogenic risk within acceptable limits. Although, the non-carcinogenic risk assessment of products HPA to HPE suggests safety, this can only be ascertained after further characterization of their health risks in detailed chronic toxicity studies. The high HI for product HPF suggests health risk for consumers of this product. The authors acknowledge Mr. Isaac Tabiri Henneh and Joseph Acqua-Mills of the Department of Pharmacology, School of Medical Sciences, and University of Cape Coast, Ghana for their enormous and selfless contributions towards this project. The authors declare that they have no conflict of interest in carrying out any part of this work. The manufacturers of the herbal products including HPF have been briefed with the findings from this study. Recommendations were also made to the manufacturers to take steps in preventing metal contamination and ensure good manufacturing practices. WHO | WHO traditional medicine strategy: 2014–2023 [Internet]. WHO. Available from: http://www.who.int/medicines/publications/traditional/trm_strategy14_23/en/. Accessed 2017 Aug 13. Genchi G, Sinicropi MS, Carocci A, Lauria G, Catalano A. Mercury exposure and heart diseases. Int J Environ Res Public Health. 2017;14(1):74. https://doi.org/10.3390/ijerph14010074. Ekhator OC, Udowelle NA, Igbiri S, Asomugha RN, Igweze ZN, Orisakwe OE. Safety evaluation of potential toxic metals exposure from street foods consumed in mid-West Nigeria. J Environ Public Health [online article]. 2017. https://doi.org/10.1155/2017/8458057. US EPA O. Risk Assessment Guidance for Superfund (RAGS): Part A [Internet]. US EPA. 2015. Available from: https://www.epa.gov/risk/risk-assessment-guidance-superfund-rags-part. Accessed 2018 May 16. US EPA opens inorganic arsenic cancer assessment for public review | EVISA’s News [Internet]. Available from: http://www.speciation.net/News/US-EPA-opens-inorganic-arsenic-cancer-assessment-for-public-review-;~/2010/02/23/4877.html. Accessed 2018 May 16. California Environmental Protection Agency CalEPA (OEHHA agency). Lead and lead compounds. 2019. Available at https://oehha.ca.gov/chemicals/lead-and-lead-compounds. Accessed 19 Feb 2019. Slope Factors (SF) for Carcinogens from US EPA. US EPA region III (2007). Available at http://www.epa.gov/reg3hwmd/risk/human/index.htm. Accessed 19 Feb 2019. Water NRC (US) C on C in D. Health Effects of Excess Copper [Internet]. National Academies Press (US); 2000. Available from: https://www.ncbi.nlm.nih.gov/books/NBK225400/. Accessed 2018 Apr 9. Sekwati-Monang B, Gaboutloeloe KG, Likuku SA. Investigation of Heavy Metal Hazards Status and Their Potential Health Risks in Vegetables Irrigated with Treated Wastewater in Oodi Gardens. Emerg Trends Chem Sci [online article]. Springer, Cham; 2016. p. 57–67. Available from: https://link.springer.com/chapter/10.1007/978-3-319-60408-4_5. Accessed 2018 Apr 16.